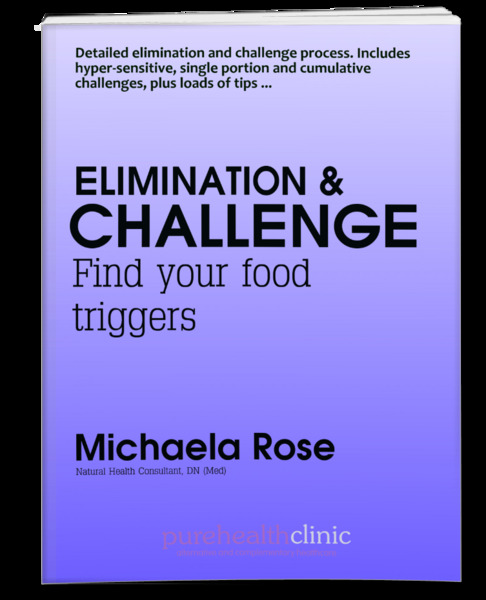 Find your triggers with this detailed 30 page factsheet giving you the clinic process I have used successfully for years. Includes 3 elimination types, 5 challenge types, loads of tips and my forms for you to copy and use. Most people don't get this right, make sure you do! I get asked several times a day ‘Can you do an allergy test?’. And, just as often, I find myself wishing there was an easy answer to give! Anyone who tells you that finding triggers is easy has no real idea of the complexities of sensitivity, trust me. Standard elimination diets advise to have one portion, then monitor, but this can be misleading as some people only react when they have had more than that. They merrily add the suspects in and wonder why they are reacting, often not realising which trigger it is. That's why I have included a cumulative check. And what about those who react to a tiny amount, how do they do it? And have you thought about what cooking methods do to food? Or how combinations might affect you? How would you test yeast? Which order should you reintroduce things in? How often should you eat them then? How do you test your barrier permeability to see if you are ready to challenge again? Questions, questions ...! As I said, get this right and it is a really efficient way of finding answers. Get it wrong and you'll just end up more confused. My advice, if you think you have a lot of allergens, might be to start with lab testing to establish any major sensitivities. Write those down and eliminate the foods, and then double-check any suspect foods that didn’t show up with the elimination process. You can, of course, check any positive foods with the elimination process, but in essence, the presence of an antibody or cellular response means that food has been or is an issue for you, whether you feel it or not. That’s usually the quickest and most effective way anyway, in case it helps. No test is perfect and it’s the combination of them that gives the most reliable info in my clinical view. Have a look in the Allergy Tests section of the shop for specific test recommendations.